If Imperial Commander still had anyone doubting that he is one the very finest chasers of recent years, surely he does not now after an imperious victory in the £200,000 Grade One Betfair Chase at Haydock Park on Saturday. The nine-year-old was making amends for his narrowest of defeats in this contest last year, when he went down by a nose to Kauto Star. Partnered by Paddy Brennan, Imperial Commander was always in a handy position behind the early pace setters Atouchbetweenacara and Nacarat. Brennan took the decision to commit at an early stage, sending Imperial Commander to the front seven fences from home. With a clear lead entering the straight, he kept on well to record a length and a quarter victory over the fast-finishing Tidal Bay. This was a third Grade One victory for Imperial Commander, following his triumphs in the 2009 Ryanair Chase at Cheltenham and the 2010 Cheltenham Gold Cup. A relieved trainer, Nigel Twiston-Davies, said afterwards: “That was a superb run, just what we wanted. He has jumped really well. It would have been nice to have had something go to him as he has had to make a lot of his own running. “But he is back and that is just what we hoped for. Roll on the King George! “We have felt the pressure in the build-up to today, much more than we did last year. Paul Nicholls must have this all the time. “Denman runs in the Hennessy next week and we will see what he does there but until then you have to say that we still have the best horse around. “With the way he jumped and relaxed today, hopefully there is better to come. I just wish there had been another horse to come to him and give him a race. “I was watching the Morning Line for the first time in a long time this morning and the doubters were very worrying. “I thought that if What A Friend had gone and won after his breathing operation, then Sir Alex Ferguson would be giving breathing operations to all of his Manchester United stars! “He will certainly come on for that race. He hasn’t had a racecourse gallop or anything like that and there is only so much that you can do at home - he was fit, but not hyper-fit and will improve for the run. "We will definitely go to Kempton now, if everything is all right, as there is nothing else for him really. Paddy Brennan added: “I was just trying to warm him up, warm him up and warm him up. It just took a bit of time getting his confidence back today but it is deep ground. 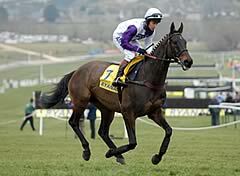 He did get a bit tired but there was no Kauto Star today and he was brilliant. He was getting high enough over his fences early on in the race but he really turned it on turning into the straight and showed me what he had - I was trying to nurse him home from there. “He is the Gold Cup winner and we can dream about that again now. “Tidal Bay flew home at the end - I didn’t actually hear him going to the last - but it was a tremendous race. My horse had a bit left pulling up and I am sure that he will improve a lot for that as well. “Imperial Commander was a bit rusty early on and was having a look - I think he maybe hadn’t forgotten what happened at Aintree last year - but he got better as the race went on and his confidence grew. Graham Wylie, owner of the fast-finishing second Tiday Bay who was beaten a length and a quarter by Imperial Commander, said: “We didn’t know which Tidal Bay would turn up today. Obviously, the real Tidal Bay turned up and with 50 more yards he would have won and that was the Gold Cup winner we were up against. “Brian (Hughes - the jockey) said when Tidal was hanging left at Wetherby he tried to straighten the horse but here he let him do his own thing. “Tidal Bay finished like a train. I don’t know where we will be going next with him, but we might mix it up with him. 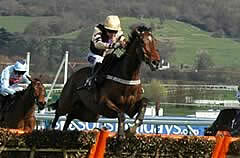 “Brian said he is a better chaser than hurdler - he is a bit more deliberate and thinks a bit more. So I will see how Howard finds him in the morning. Philip Hobbs, trainer of the third Planet Of Sound, said: “I was very pleased with the performance - we just think better ground will help him so hopefully he will have that in the King George where he goes next. Tom George, trainer of the fourthNacarat, said: “I was thrilled with him - Haydock is not really his track. “He went with Imperial Commander and just for an inkling it looked like we could beat him. 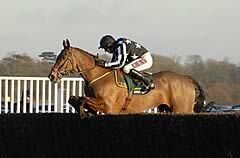 Paul Nicholls, trainer of 3/1 second favourite What A Friend who finished fifth, commented: “He did not run his race. Sam (Thomas) said What A Friend hated the tacky ground - no excuses bar that. “On that performance, he is not good enough to win a Gold Cup. He goes well on good ground. He needed to improve on his form last year and does not seem to have done so.